Thank you for humoring me yesterday and reading the saga of my writing career, and even leaving some kind comments. Today, I will show you something else I did yesterday. 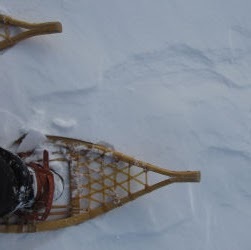 A friend from the trail club called and said she had to come to town, and would I like to go snowshoeing? Well, duh! Pretty much wherever she goes, three dogs go too. 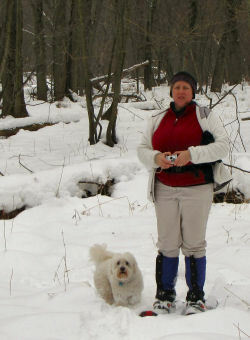 That made it easy to decide to do the Pere Marquette River loop trail because there is no problem with taking dogs there, and one hardly ever encounters other hikers. The dog population is an interesting mix. Maggie completely ignores all three of the others. They have been on a lot of hikes together, and they might as well have plexiglass walls installed between them for the amount of interaction they demonstrate. The two labs are Cedar and Teak, and the little Bichon Frise is named Corky. Want to guess who is the Alpha Dog? Do you remember this bridge? I was just there with Ellen not long ago. 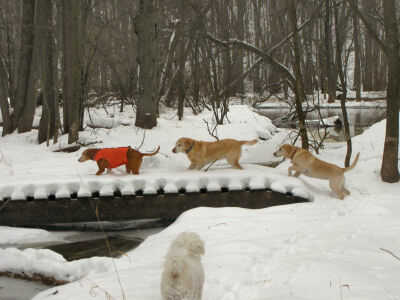 I think it's pretty amazing that I got a picture with 3 of the 4 dogs lined up so nicely! It's usually more like complete chaos! Cedar, Teak and Corky do not ignore each other. They chase and chase and Corky nips at their legs and keeps things interesting. Every time I take this walk I try to get some pictures that don't look like all the rest. For the first time I noticed this old mower parked - maybe abandoned. The teeth make a stark silhouette against the whiteness. This is one of my favorite spots on the walk. 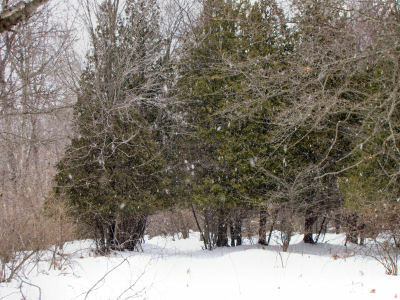 There is a "wall" of white cedar trees, and the trail goes through that larger opening near the left end. It always looks to me like an entrance to a different world. It just seems so odd to find that line of cedars planted out there. Finally, I'll just add a couple of closeups of where the ice was hanging above the surface of the river. I'm not sure what was unique about the conditions that made the icicles have that pinched form, but it was true of every place where there was a "shelf" like this with icicles hanging below into the water. You can see what I mean better on this closeup. Keep looking at it. 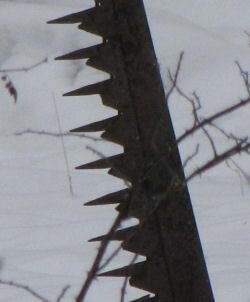 Look at the odd way the ice fans out from the little stubs of the branch at the top. 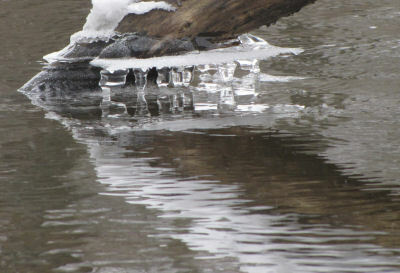 Can you tell where the icicle stops and the reflection begins? For sure, the ice will always give me something different to share, as long as I remember to look at the details. Tomorrow, Ellen and I are doing our "First Friday" outing. We are going to Bowman Lake. 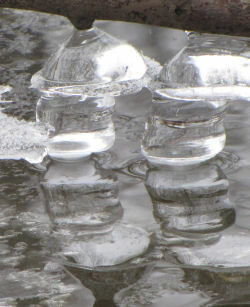 Prepare for more ice and snow pics tomorrow! Warning! This is another very personal post, but after a lot of waffling, I decided that it belongs on this blog. I have been a member of the Accentuate Family of Writing Services for a couple of years, but only became active recently. Accentuate is the brain child of Michelle (Michy) L. Devon, and offers lots of support for aspiring writers. It's free to join, and with a five-year history, really can offer more than moral support. Anyway, Michy posted a blog prompt challenge which began: "Take us back in time to the beginning of your writing passion, career, love, interest, or hobby and show us what it looked like way back then, before queries, before rejections, before you submitted or made a penny - back when you wrote simply because you were a writer...." The questions she poses continue, but the following is my rather long-winded response. Back to nature tomorrow. Sometimes I have a reason to write, and sometimes I just have to write, without any reason attached to it at all. As a child I could both read and write at an early age and this allowed me to record ideas that came into my head. The earliest "creative" expression of my writing that has survived seems to be a recipe for "YoYo Treats" that I wrote at age 5. That also seems to be one of the few writing projects I ever finished. In much the same vein as Everything I Need to Know I Learned in Kindergarten, that sentence is pretty much the story of my writing career. Everything you need to know about my writing career is found in my elementary school portfolio. Very few things get finished. I loved words- the sounds of them and how they fit together. I remember driving the adults in my world crazy with endlessly reeling off lists of rhyming words or singing poems to toothpaste jingles just to see how they either fit or clashed, or how words sounded when the emphases were changed. I would explore words that sounded alike and query anyone who would pay attention about whether the words were really related or just sounded alike. Adults hate it when small children are full of questions to which they don’t know the answers. My next major work was begun at about age 7. That has survived, and it is entitled The Adventures of Skippy the Field Mouse. Two chapters are done: "His Spring Adventure," and "His Adventure with the Cat." Chapter three has a name: "His Trip," and two sentences. In total, the work is about 800 words (I just counted). Maybe impressive for a seven-year-old, but still... unfinished. However, it is self-illustrated, which was to become important to me as well. In 5th grade, I wrote a play. I no longer have a clue what it was about. The teacher allowed other students to volunteer for the roles, and we were sent to a small room off the cafeteria to practice, for performance to the class. But I was always a bit of a freak to the other kids. I had no leadership skills at that point, and they would not practice, but only used the play as an excuse to get out of class and fool around. I was too serious of a child to understand their motivations, and ended up in tears, with an unproduced play. Hmmm.... this sounds like the ending of many a grown-up tale. In 7th grade, I had my first work published. It was a Christmas poem which won a contest and was printed in the local paper. This won me many kudos with the adults in town, but further alienated me from my peers, with whom I had little in common. I continued to write lots of poems throughout high school, but I have no idea where any of them are any more. The next one that I seem to still have was written almost 10 years later. Throughout high school I continued to write "stuff," but was never focused, always wanting to try out new things rather than finish any one project. I got pretty far with a "slide show" story. It also does not survive, but it was an animated story that I told by drawing pictures on 3x5 cards. I had received a toy projector for Christmas that projected 3x3 images on a wall with a light bulb. The 3x5 cards were perfect. I could draw a picture in the square and have a tab left to feed the pictures in and out of the machine. I was as fascinated with the mechanics of the process as with the story. I think the heroine was a girl named Lulu, but I don’t remember what was happening in the story. I remember pictures with umbrellas, so it must have been a wet story. Enter my interest in multi-media. Also in high school, I became more fascinated with language itself, and truly angry with English for being so irregular. I created a language of my own that followed very strict rules of tense, grammar, structure, etc. I’m sorry to say that this is also gone. I would be quite interested to observe how my teen-aged brain attacked that project! I sporadically kept a diary/ journal, which I still have. It’s really boring. Somehow, I never understood that a journal should record thoughts and feelings and not just a description of what I did for the day. All of what I just said about journaling and me is still, sadly, true. Although I have done better, from time to time, I often have to make myself remember to write down how I am feeling. I’ve shared all of this to demonstrate that there is a part of me that has to write. Children don’t write things like those I’ve described unless they really want to do so. The periods of my life that have been the most stressful and depressing seem to be the times that I have written the most. At one point, as a young adult, I told someone that my brains just seem to run out the end of a pen. So, most of the personal expressions of my life that are recorded are from the times that are the very worst– and there have been some very bad ones. I’m much less needful of writing down the good things. For a while in the 1970s and 1980s I worked really hard at submitting articles and poems to magazines. I never had a single one accepted. I do have three articles in two compilation volumes published by Youth For Christ. I was invited to submit these. This was nice for the ego, but I received no compensation for them. During this time period, I began to realize that I am best at writing short essays. Like poems, they require an efficiency of words which I enjoy fashioning. Why did I want to move from writing for myself to being a published writer? That is a very difficult question to answer. Everyone likes to feel that their talents are appreciated by others, so that is one component, to be sure. I was always hopeful that I could earn some money by writing. I’d been told that I was very good at writing, all my life. So when I kept reading stories and articles that I knew weren’t as good as what I could write, my ego just had to exert itself and try to prove that I could do better than that. Of course, I quickly came face-to-face with one of the permanent realities of my life. What I like, who I am, and how I want to write are not the things that publishers want to buy. One telling rejection letter says, "We do not believe that our readers would appreciate the humor in your story." I continually write poems, although in fits and jerks as I discovered when I actually collected all the existing ones into one notebook, and organized them chronologically, this year. Some are just garbage or so-so, but a few are quite good. Thanks to a grandmother who raised me on real poetry, I do know the difference, even when I am the one who wrote it. Poetry, however, is almost always written because it just needs to come out. It is what it is, and readers can take it or leave it. Critics can label it poor, sappy, unimportant, or great. Nevertheless, when it was written, those thoughts were critically important to the poet. Then came the North Country Trail. 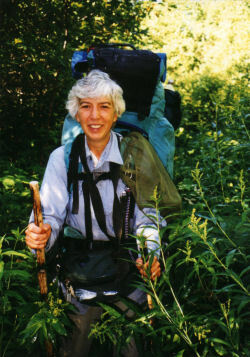 I began to hike it in 1991, and by 1995 was writing up accounts of the hikes I had taken on it, just for the people who had hiked with me. Timidly, I showed it to a few other people, who quickly said, "Oh, this HAS to be a book," and thus began North Country Cache, a collection of essays about my hikes on the trail. It is my primary success at actually finishing a large writing project. Soon I was writing for the NCT Association’s quarterly magazine, but still for no money. When the NCTA’s 25th anniversary was looming they asked me if I could finish the book in time for that year’s conference. Deadlines actually make me finish things! AND... here was a group of people who sincerely wanted to see something that I wrote in print, and available for others to read! I had 29 of what became 68 chapters done. In 2004-5, I finished the writing, and self published North Country Cache (knowing that publishers would probably balk at the format and the topic). My husband now grimly calls it "The Year of the Book." It was a frantic race to get it done on time, but I made it! Being a published author is great, even if it is self-published! I like the credibility it gives me- if nothing else it proves that I CAN finish something. Everyone who reads it seems to like it, even non-hikers. The people who know that I am almost done hiking the trail are clamoring for the sequel. Of course, there is nothing like an eager public to make a writer want to keep writing! And now, the blogosphere has flowered into a playground for writers. I find that this fits part of my need to write very well. For me, blogging is something of a public journal. I can write about events in an informal way, and add photographs that I have taken. Quite a few people seem to enjoy what I share. This motivates me to keep it up. So, part of why I write now is the public component. When people like what you do, you have a natural tendency to want to continue that activity. Several on-line venues exist for writers to make money. A friend encouraged me to write for a couple of those. Once again, all that did was reinforce that knowledge that I don’t fit the common molds. I thought that with a potential world-wide audience that there might be a niche for me. But, as with traditional publishers, sites have to market their material to make money. I make a few cents at these venues, but there is little to motivate me. A typical rejection notice: "This is not a topic readers search for." Needing money, however, I have discovered several online places where I can do web copywriting for money. This is now the primary way that I pay my bills. However, it’s a killer. Never have I written so much and enjoyed it so little. Cramming words and phrases into formats to meet SEO requirements on topics of marginal interest to me only makes me hate writing. I’m very slow at it, because the words do not flow in natural patterns, and often it takes a great deal of research to crank out 400 words of meaningful content. Am I still compelled to write for myself? This answer is the same as always: inconsistently. At this point in my life, I’m really bored with listening to myself whine about the same old issues that I’ve struggled with for the past 60+ years. And believe me, I may have matured (I hope), but my inherent weaknesses and strengths are the same ones noted in my kindergarten file. How those traits clashed with the real world, or gave me strength to overcome some very difficult times is all recorded, in fits and starts, across the decades. I get very mixed messages from my support network about my writing. No one in my family gives a rip [whoops- except SIL- sorry, Loretta]. They have not read my book and do not read any of my blogs. Only one of my real-world friends reads my blog. I tend to run in circles of non-internet people. I’ve made many very good friends through this blog, whom I value very much, and those of you who do follow this blog, or who have read my book, know more about me than most of the people who claim to be my friends. I continually struggle with this dichotomy... if I am the person who needs to write about my experiences, and my "friends" have no interest in reading any of this, does this mean that they are not interested in me, since this is who I am? Several years ago, I decided that I’m going to leave the whole pile of journals, letters, and poems to my Alma Mater and let some poor library assistant sift through the sludge. I think there is a story in it all, but someone with a less jaundiced eye will have to tell it. I’ve had no astounding adventures this past month. I’m as willing as the next person to stay inside when the fields and roads are covered with ice. I discovered about 25 years ago that falling down wasn’t nearly as much fun as it had been 35 years ago. So, this afternoon I’m headed out the back door to find something to write about. Perhaps I should tell you about the morning a couple of days ago when the snowflakes came down thick and soft, muffling every sound so thoroughly that I nearly didn’t hear the train go by. Every tortuous black branch of the sumac was lined with an icing of white, and the dusted pines bowed with the combined weight of a million soft flakes. Yesterday, of course, was a different story! All softness was swept away by the 25 mph winds, which glazed the snow into a fragile crust. I broke through with every step, even on snowshoes. Great puffs of snow were lifted from the trees and hurled into the sky like smoke signals, and the wind howled across the ridge. It was all I could do to remain standing! But today? Today the sun is shining, and the wind is not blowing. 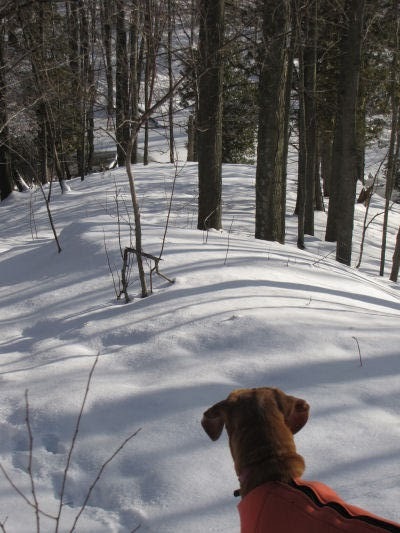 The dog and I step out the back door and head for the Pere Marquette River. Our adventures are of the familiar kind. Animals whose tracks almost everyone recognizes have been out. Rabbits and mice have ventured from beneath thick bushes to leave their distinctive marks. The deer have traveled the farthest, pawing deep furrows in the snow. Stark crow tracks march across the field before disappearing abruptly where the bird took to the air. Maggie and I reach the bluff above a backwater of the river– one of my favorite spots from which to contemplate the world– and note that the ice is not yet solid even on those shallow fingers of water. 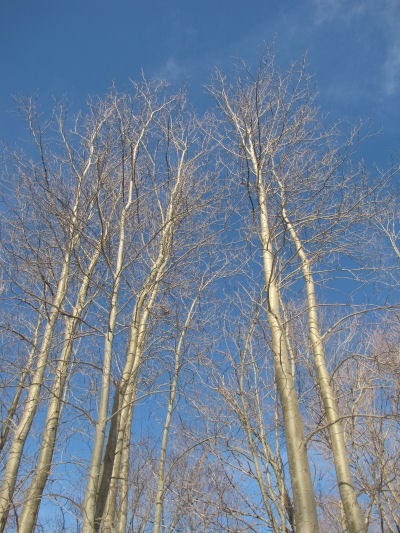 Aspen trunks, which don’t seem remarkable most of the year, stretch long golden fingers into the blue sky. Dark hemlock and rustling beech line the steep hill above the quiet bay. As we return from the river, with the sun at my back, I can feel its warmth through my parka, and my shadow races ahead of me as we follow our homeward tracks. Every tiny hillock throws a long shadow and I see miniature landscapes of ever-changing geology. 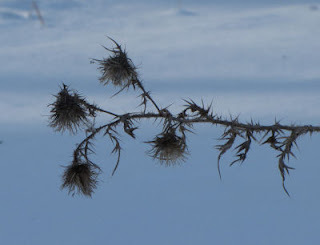 A dried and broken thistle stalk is silhouetted against the white background, imitating an oriental painting, or perhaps a many-headed dragon! All too soon, I'm back inside the door, stripping off my snowpants, and hoping not to peel off the joys of the afternoon along with the nylon. 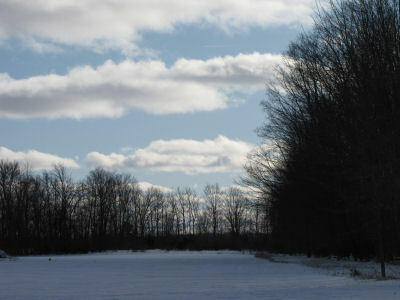 White clouds against blue sky on a calm and sunny winter day? Evidence of varieties of interesting wildlife so numerous that we consider them common? The ability to access all these without ever turning a car key? Perhaps this is astounding enough. This is not about to become a video blog, but the contrast with yesterday was so sharp that I went back to the house to get fresh batteries just so I could capture this. Oh, and where it gets all shaky.... that's because I was having a pretty hard time standing up. It was wonderful to have real snow to cover the crunchy ice created by all the freezing rain of the past couple of days. You can join Maggie and me on our morning walk. I'm learning more about video editing. I think I would have liked to add a music track, but maybe not. What you get is just the natural sounds- or lack thereof! The quality sure gets degraded when you save video for the web. Maybe next time I'll choose a higher resolution and we can see if the file is too bulky to load well. I had fun... hope you will too. I sort of promised a picture of Steve, and so I'll share our annual family photo. He's on the left, and as you can see, there is now plenty of him to love. You may also notice that Josh is wearing an interesting facial decoration. An abscess he's had on his face for a while suddenly got much larger, so we spent the afternoon of the 24th at the emergency room where he had it drained and packed with antibiotic. After taking Steve to the airport today (a long, long drive in very poor visibility), I took Josh in to have his face checked. I think that he is going to end up with a nasty scar. Also today, since we hadn't had enough excitement, there was a big "whump," and the Christmas tree fell over! 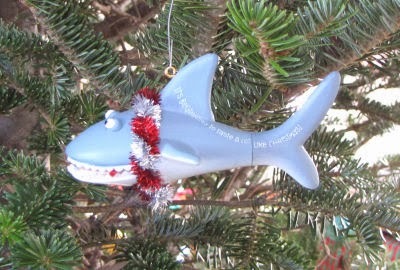 Only one of our favorite ornaments broke, mostly lost just plain ones. Poor Om! Now he has to decide if he wants to decorate again. We set it back up, but most of the ornaments are just in a box now, and the lights are rearranged in a novel fashion. The Quality in today? Well, we did get to the airport on time, and I got home safely. I think that Josh may have gotten the message that he has to get his teeth taken care of (which is causing the abscess). And it was great to have Steve home. He didn't make it last year because he had a new boss who was looking for any little reason to lay people off (like asking for time off). So we just tried to enjoy our time together for the three days we had this year! Time to get back outdoors tomorrow. We are supposed to get major snow tonight, which will be great to cover the ice from the freezing rain we've had for the last two days! Welcome to the Shark's monthly contest. Winning entry or entries will earn an ad for a month on this blog. Entries are due to me by email at jhy@t-one.net by midnight Dec 31, 2009, Eastern Standard Time. There is a real word puzzle this month, and two tie-breaker picture questions. Anyone with enough persistence should be able to solve the puzzle. It is an anacrostic, which is my favorite kind of word puzzle, and I have discovered that I like to make them up as much as I like to solve them. The one caveat is that I can't really tell ahead of time how difficult it is going to be, so I would appreciate it if anyone who tries the puzzle would tell me two things: Is this the first anacrostic you have ever tried, and was it easy, medium or hard. Note: Carmen already found an error. Sigh. Apparently I can't tell the difference between Ls and Is. So I'll give you clue R. It is ILLIUM (which is actually spelled wrong). Have you tried an anacrostic before? The goal is to fill in the grid, and thus spell out some saying or quotation. They are complex, but that actually gives you more help in solving them. When you download this and print it you will see that there are two parts of the puzzle. There is a list of clues, in this case from A to CC (29 clues). These have a question and blanks in which to place the letters of the answer. The number of blanks and their spacing tells you how many letters and words are in the answer. Under each blank is a number. These numbers are used to transfer the letters to the other part of the puzzle, which is a grid. Each white space in the grid has a number and letter. When you answer a question in the word list, let's say that the first letter was "T" and there was a number "5" beneath that line. You would put the letter "T" into the box numbered "5" on the grid. Once you answer the questions that you can on one try, and transfer those letters to the grid, then you can use the grid to work back to the list to help you get more words. For example, we put "T" into space "5." Let's say that we also have an "E" in space "7," and in the grid, 5,6,7 is a three-letter word. You now have T _ E, and you might guess that the missing letter is "H." You can use the letter in the grid box to put that H where it belongs back in the word list. So if space "6" has "6P" in it, you would look for clue P, and the number 6, then put "H" in that blank to help you get that clue. There is one more way to get some help. The first space of each word in the list will vertically spell out the name of the author, and the work that the quotation was taken from. So if you begin to see a word or name taking shape in those first letters, you can take a guess on the missing letters. Using the dictionary or online research is completely permissible. Just send me the quote and the name of the author and work quoted. No need to scan the whole grid and send to me. If you have the quote correct, I'll know you solved it. 1. Who made the footprints in this picture, and in which direction is each traveling? 2. What made the prints that the red arrows point to? 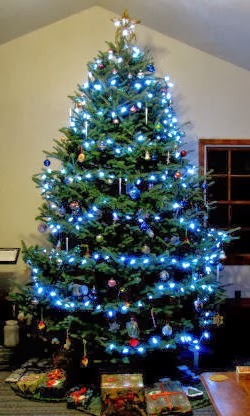 Per request, here is the decorated tree for this year. We didn't have any lights that were still working, and a search of the stores didn't turn up much of a selection at a late date. So we got one string of white LED lights, but they look bluish, and very blue in the lighting for this picture. I like blue! See It's Christmas, What Else? See this little guy? Do you know what it is? Of course, the title of the post might help you a bit. This is a very distinctive seed pod, of trees in the genus Tilia, which are basswood to Americans, but lime tree, or linden to British or European friends. In the early summer, these would still be on the tree, with a small flower at the end of each of those stalks. The leaf is large and interesting, but I'll save that mystery for another day... like in summer when I can find a leaf! Now here is the mystery. As far as I have observed, the only basswood tree anywhere in my kingdom is along the railroad tracks near our eastern property line. But I found this seed pod, and several more, far to the west by the cemetery a couple of days ago. Of course, the wind carries seed pods, but the winds are usually from the west. An east wind usually blows up a storm. Of course, it makes sense that in a strong east wind these might have blown across the fields (about 800 feet) and been dropped when the wind hit the trees at the edge of the cemetery. Still, it seems odd that I found a little cache of them in that one spot. Here's the next part of the mystery. I wasn't aware that my basswood tree had flowered. This is kind of a sad story. We had a terrible wind storm here in 1999. One of the casualties was my large Basswood. You can see the broken trunk in this picture. The tree just snapped off about 10 feet above the ground. I cried. But since then, new shoots have grown from that stump. In the picture you have to ignore the saplings in the background and the telephone pole, but most of the angled branches are Basswood shoots. It's growing nicely! But I sure hadn't noticed that it was big enough to flower. I may just have to hunt more carefully in the cemetery to see if I somehow have missed seeing another of these wonderful trees! Hi everyone! We just got home from the airport and I'm pooped. But the sun did peek out this morning, so finally, we have the winter solstice only one day off instead of nearly a month. The top panorama is this morning, and the bottom picture is the summer solstice this year. Remember, the red line is just to use to line up the pictures- it always goes through the same tree. So now you can see the north-south extent of the sun's path here in my kingdom. Gotta go to bed. I'll answer all your great comments tomorrow. This is another of those kinda personal posts. But it was totally clouded in this morning, so no sunrise and no precise Kitchenhenge. Therefore, you get to share in the other big event of the day. Joshua's 40th birthday. (Well, unless you want to call the fact that his refrigerator died the big event.) We took him to Ponderosa for lunch to celebrate (the birthday, not the dead refrigerator). 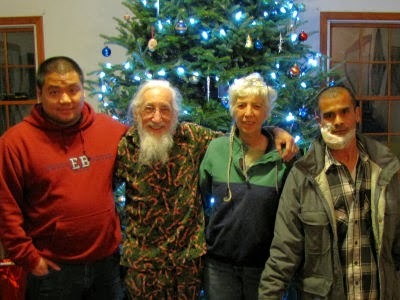 Josh is the middle son, although he was the last to join the family. 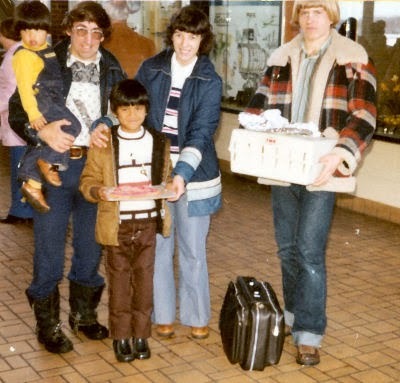 Here we all are, on February 4, 1977, when we first met him. He came to us with basically what you see here: the clothes on his back, a cat in a carrier, a huge cookie that his foster family helped him make for us, one paper grocery sack of toys (not pictured), and one suitcase of clothes. Oddly enough, the suitcase in the picture is not his. Funny how I just noticed that anomaly. I guess this one must belong to the social worker that traveled with him on the airplane. Here is my all time favorite picture of Josh. In true grown-up guy fashion, he hates it, but that's ok. I'm the mom, and I get to like it anyway. It was his school picture in the fall of 1977, just about 7 months after joining our family. We were going to buy him shoes today, but given the appliance issue, gave him the option of a used refrigerator. That was his choice, so we spent an hour hunting the area for a used one. No luck at all, but we've put in his name with all the charities, and asked to be called if any of the stores get one in. So after all that, we took him home with no shoes and a bar fridge from our storage shed. Oh, the little munchkin being held by dad is Steve. We pick him up at the airport tomorrow night, so you might get to meet him in the next few days, if he doesn't object. Sam is on the right. We don't really see him any more. Makes the lawn lose its worth. Ski path's full of dents. Oh! What would be gone? The spare key? I forgot." Mom, I love you, you know. I would have had a pretty amazing video for you if the batteries in my camera hadn't died. Isn't that the story of so many great shots? So I'll have to try to describe the joyful singer to you. At the end of the church service today, all the little kids were brought in from the other room. I know you know where this is going... Yup, the kids sang a Christmas song, in fact, "Joy to the World." They actually did a good job. The children knew the words to three verses by heart, and they weren't just singing along with a vocal track that covered their voices. So that was impressive. But, I'm here to tell you about the little guy in the front row. 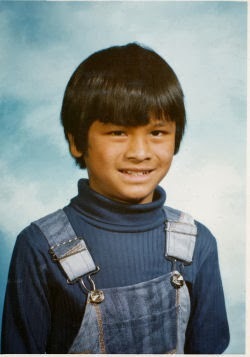 He was about 4 years old, wearing neat black pants and a white shirt over a red turtleneck. His black hair was cut in long bangs, but did not obscure his eyes, which were dark sparkling buttons in a pixie face. We haven't been attending this church for long, so I have no clue whose child he is, or his name. He gets this press coverage based totally on his merits, not because I know him to be a cute kid in another setting. Well, the kids began to sing, and they all were focused and singing and smiling (as opposed to some such performances where the kids stare in all directions and occasionally sing a word or two). But even in this group, our little fellow was a standout. His face lit up in a smile as big as any you will see on Christmas morning over a new toy. His eyes sparkled and he waved his wand with the word "Joy" emblazoned in glitter in time with the music. He knew every word of every verse, and could barely contain his enthusiasm for the singing. This was a boy who personified joy! I am reminded of a pin-back button that I used to display on the dash of a vehicle we owned. "If you feel the joy of the Lord in your heart, please notify your face." For someone who tends to be Scroogeish during this season, the lesson from this small boy was much more powerful than the sermon. 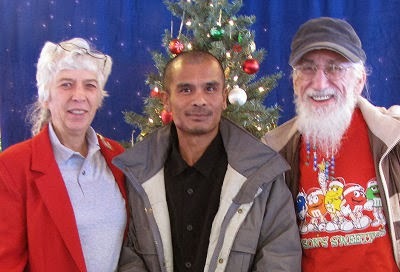 If there is truly "Joy to the World," then I should act more like it. OK, it's not really a space station, but that's what I call it. It's a cooperative grain elevator, and it's just one field away from me. With all the towers and guy wires and the noise of the motors, it's just a bit too futuristic for the landscape I would prefer. I know this is inconsistent, since I'm really a fan of local agriculture, but... it's weird. So, that is why I have a flock of pigeons. Now, I just looked up the life span of a pigeon on Wikipedia, and it is 35 years! I guess the unusual ones that I have been seeing for a few years are probably the same individuals. I know that wild animals rarely live as long, but these birdies are very well fed, so they only have to watch out for my hawk or perhaps a fast fox if they aren't paying attention when on the ground. Yesterday I asked you to look for the birds that were different. Most of you noticed that there were a couple of birds that were a different color. And there you have it. This wasn't supposed to be a tough quiz! Here's your first peek. When this flock wheels in the sunlight those two birds with the mottled brown color just stick out like golden coins in a tub of lead slugs! But I don't usually carry the binoculars on walks out my back door. The new camera did a fine job though- aren't they gorgeous?! I had no idea that they were mottled like this. And look at their tails- it seems to me as if they are like negative and positive images of each other. I tried to find out more about brown pigeons, and did find one other picture, but that bird is all brown. I've linked to it below. I did get a couple more interesting shots of the one with darker brown- I think I'll call this one Dusty, since his wings are speckled. The one with the all brown wings will be Rusty. I'll try to get some more pictures of Rusty and Dusty. The group seems to live permanently at the grain elevator- not a big surprise. Meanwhile, I'll just end with an image I altered for fun, but I like the way it came out. I'm tired. I stayed up all night again last night, and grabbed 3 hours of sleep this morning. But let me take you to Pigeon City. At least that's what I'll call it today. Tomorrow I'll tell you what I really call it. Now pigeons aren't very exotic. If you live in a city, they are probably one of the birds that you can see all the time. But I just have one little flock. My pigeons live next door, and just to point out that one has to find the right perspective to get nice pictures, above is the first view I had of them yesterday. Not so attractive. But they were so focused on gobbling up the excess grain that is thrown in the field by the grain elevator operators that they ignored Maggie and let me walk around the end of the fence without flying away. Now, let me tell you something about this flock. There are a very few pigeons that are different from the others. I've been hoping to picture those special ones for about two years, and with the "new" camera I might be able to. So, I'll join the flock of pigeons bloggers who are posting games this week and ask you to find the different birds in this picture. Tell me what you think makes them different in a comment. Tomorrow, I'll show you! G'nite. I Think Winter Has Arrived!